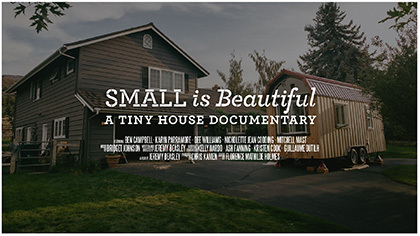 We’re excited to announce DC’s first showing of Small is Beautiful, Jeremy Beasley’s new tiny house documentary. Join us on Tuesday, July 21st at 8PM at Woolly Mammoth theatre for a wonderful exploration of the physical and emotional challenges and rewards of building tiny, told through the eyes of four do-it-yourselfers building and living small in Portland, Oregon. And after the film, we and a few other tiny house enthusiasts and builders will host a Q&A about the tiny house movement and our own experiences building tiny houses, and a tiny house community, here in Washington, DC. Seating is limited, and while our community events are usually free, for this we have to charge to cover the costs of rental space, screening licenses, and A/V support (of course, donations to keep these events going are always appreciated even if you can’t make it). And thanks to Woolly Mammoth for their support and helping us screen this film. Go grab your ticket here! Introducing the Tiny House Collaborative and DC Workshop!